Marc Marquez is a professional motorbike racer, born in Cervera, Spain in 1993. He won the MotoGP World Championship in 2013 and 2014. Marquez takes third place in the Czech Republic GP at Brno. Starting from pole position, he drops to sixth place, before recovering to finish behind Valentino Rossi in second, and Cal Crutchlow, who wins the race. Marquez continues to lead the Word Championship, with Rossi in second place. Honestly today I did the wrong strategy. I thought that maybe it would keep raining. i thought it would be a flag-to-flag race, so I go out with soft tyres, and try to push from the beginning. So then I have to manage my soft tyres, because I know that Cal was with the hard ones. Also Valentino had the hard rear, but in the end we lose only four points to Valentino. Really happy with the final result. Marquez says Rossi’s tow helped him secure the perfect lap in Czech GP qualifying. I found, honestly, the perfect lap. I overtook in the last corner, but I had a small slipstream from Valentino and this helped me quite a lot to get pole position. I lost some time in the last corner, but the time that I gained during all of the lap with this small slipstream was much better. I didn’t expect to be on pole and I didn’t expect this lap time. Normally I would ride alone but this time I found a good slipstream and maybe this slipstream gave me pole. Marquez takes pole position in the Czech Republic GP, ahead of Jorge Lorenzo and Andrea Iannone. Marquez says he is amazed he was able to retain control of his bike when he nearly crashed in Free Practice. When I lost the front, the first moment I thought, ‘this is a crash’. I was lucky because I could a stand [up] the bike a little bit, but the front was still closing. When I was there, I was with the knee pushing on the floor, and in the end I was able to save it. Sometimes I say you must be lucky to save that, but already many times [I’ve done this]… so something is there. How I do it I don’t know. But I hope to not repeat it in the race. After coming sixth in the first session, Marquez recovers from nearly crashing on Turn 13 to finish the session leading the field. Today wasn’t an easy day, especially in the morning when we started and the feeling wasn’t so good. Then for the afternoon we changed and we made some changes in the electronics and the setup and it was working slightly better. We still have to improve. Ok, we were first and have the fastest time but with the used tyre we must improve a lot. It looks like both Yamaha riders are strong here, which is what we already expected – and we’ll see if we can improve our rhythm because especially Iannone on the Ducati is fast, too. Marquez takes fifth place in the Austrian GP. The race is dominated by the Ducati team: Andrea Iannone wins, followed by Andrea Dovizioso. Despite his shoulder injury, Marquez comes fifth in qualifying for the Austrian GP, 0.333s behind Andrea Iannone, who takes the pole. Marquez crashes in FP3 for the Austrian GP. He dislocates his shoulder and is taken to hospital by helicopter. Rossi says his relationship with Marquez has improved. I think that after what happened, all the rest becomes not very important. Very very small. I think it’s the right thing to do. Our relationship has improved since Montmelo. Marquez’s pitstop during the German Grand Prix is ruled legal after IRTA examines the telemetry of the Spanish rider’s bike. Holding the clutch is not illegal, but from the German Grand Prix onwards due to safety reasons it is not legal to have a gear engaged. A closer look at the video posted on social media makes it clear that Marquez engages first gear right as he lands on the bike – a move confirmed by IRTA, which considers the matter to be closed. Marquez wins the German GP, with a 20 second lead over Cal Crutchlow in second place. After a poor start, Marquez settles in 7th place. As the track dries out, on Lap 17 he is the first rider to change types to slicks, giving him the advantage over the rest of the field, who delay changing tyres until closer to the end of the race. At a certain point today, I thought my run at this circuit was going to come to an end. But in the end we succeeded and earned a very good result, especially considering how Valentino and Jorge finished the race. It’s always very difficult to decide when to change bikes, and perhaps we made our switch very early…but I decided to take a chance and it went well. 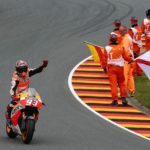 Marquez takes pole position on the grid for the German GP, leading Hector Barbera and Valentino Rossi. I’m happy to have set the fastest time today, because we’re better here than at other circuits. I have a fairly good pace and am riding comfortably. We’ll see what happens tomorrow, because the weather forecast is for conditions to be quite unstable. In any case, we’ll try to finish on the podium, which is our goal. It seems that Valentino [Rossi] is very strong, and we’ll also have to keep Dani [Pedrosa] in mind; I don’t know what happened to him in qualifying, but his pace is very close to ours and he’s very strong here. Marquez says that Rossi is still a factor in the Championship. Jorge is at the moment the strongest one, because he is the closest one in the championship. He is second and will be really strong in the second half of the season, so we need to take care about him. But also not forget Valentino, [the gap’s] far but not far enough. Like we saw last races, he was very strong, and it will be hard to manage this distance. Marquez comments on his progress ahead of the German GP. We’re going to the German GP aiming for a podium position and of course possibly to fight for the win. The Sachsenring is normally a very good track for me that I like very much, maybe because it has so many left-hand corners, a bit like a dirt track! On the other hand, it’s another one on the calendar where the weather has sometimes played a crucial role in the past, so we’ll see how it goes there. We’ve learned from the past and we’re approaching this season race-by-race, trying to be ready and make the most of what we have and what the situation requires. Marquez believes his consistency in 2016 — he is the only one of this year’s title hopefuls who has scored in every race — is a direct result of last year’s struggles. It’s a conversation for a pub. We are not even halfway through the season and I don’t even have a one-race advantage over the guy in second – although it’s obviously important to have this gap, especially over Valentino…All human beings learn, and what better way to do it than from your own mistakes. I’m one of those people who can be told 20 times that there’s a wall in front of me, but until I hit it head-on, I don’t believe it’s there. Marquez comes second in the Dutch GP at Assen, behind Jack Miller. After restarting the race in fifth place he took third place behind Miller, Valentino Rossi and race leader Dovizioso, until Rossi and Dovizioso crash out. This second place today is like a victory, these points will be important in the championship. The DutchGP is stopped on Lap 15 of 26, due to rainy conditions. Marquez is in fifth place, behind Scott Redding, Valentino Rossi, Danilo Petrucci and race leader, Andrea Dovizioso. The race will be restarted if conditions improve. Marquez places third in Friday Free Practice at Assen, for the Netherlands GP. The 2014 chassis is the one that last year I came back to in this race and still I’m using this one. It gives me a lot of confidence with the front tyre. Confidence and warning, which is important. For example, when I tried the new chassis in Montmelo [test] it was in some parts better, but in other parts – like corner entry – it was worse. So we are trying to find the best compromise to adjust the back of the new chassis to this 2014 chassis, because I think it can be a good solution. 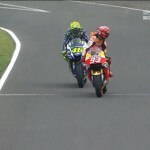 Marquez and Rossi shake hands after the race. Marques takes second place in the Catalunya GP. In the final laps of the race he was able to overtake Valentino Rossi, who had come up from fifth place on the grid to take the lead from Lorenzo. However, Rossi overtakes Marquez on the penultimate lap to win. It was a really difficult race. In the end I was on the limit. It was a great battle. This battle was for Luis Salom. Marquez takes pole position in the Catalunya GP. He is followed on the grid by Jorge Lorenzo and Dani Pedrosa. Marquez signs a two-year contract extension with Honda Racing. I’m very happy to announce this renewal with HRC, especially coinciding with Grand Prix of Catalunya, my home GP, where I have some really good memories. HRC and I have a very strong relationship, and I’ve always wanted to continue being a part of the Repsol Honda Team. In three and a half years together, we’ve enjoyed some unbelievable moments, with great victories and two world titles, as well as a few challenging moments that I believe are making us stronger. We’re working very hard this year to regain the title. It’s a great honour to be a part of the Honda family, and I’m glad to remain with this special group of people for another two seasons. We’re honoured to have reached an agreement with Marc for two more years. There’s no doubt that he is the present and future of MotoGP! We know him well and he knows us well, and we both wanted to continue together; for this reason, we felt no rush for this renewal. Marc has grown a lot during almost four years with HRC, and now he’s an even more complete rider than in 2014, when he won 10 races in a row. Although he’s still very young, we already have a long relationship together, and we know that Marc’s experience is very important for helping our engineers to develop our bike. Marquez says being booed on the Mugello podium made him limit his celebrations after finishing second in MotoGP’s Italian Grand Prix. The reaction was not the best one. For that reason I didn’t celebrate a lot on the podium because I don’t like this. Today all the circuit was yellow but in the end all the circuit enjoyed the last laps and the show and that is most important. Marquez comes second in the Italian GP. After Valentino Rossi drops out with engine failure in lap eight, Marquez takes second place after Jorge Lorenzo. 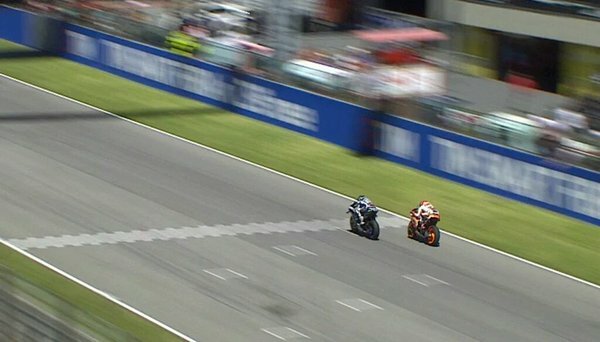 In the final lap Marquez overtakes Lorenzo and is ahead until the final straight, where Lorenzo uses his slipstream to overtake him in the last second of the race. We were struggling all weekend. i did the best race possible today. Marquez says his fourth place grid was a result of his bike’s lack of stability. The Ducati on the straight is really fast but here we are also losing to Yamaha and Suzuki in the small accelerations. OK, here that is not as demanding as Le Mans, they are small ones [straights]. But with one tenth here, one tenth there, in the end we are losing a lot. We cannot use all the torque because of the stability on the rear…The electronics we are working really hard. Honestly we are still not perfect. We need to improve there, the stability. It looks like it’s not such a stable bike. At the top is Ducati. It is very stable. Then Yamaha. Suzuki is more unstable but they can keep pushing. For example in Le Mans we cannot use the power for the wheelie. The wheelie stops us and we need to reduced the power for the wheelie. Here we have the wheelie but the worst problem is the stability on the exit. Marquez takes fourth place on the grid for the Italian GP at Mugello, 0.255s behind Valentino Rossi, who takes pole. Maverick Viñales comes second, and Andrea Iannone is third. Marquez’s fastest lap was hindered somewhat but a small mistake towards the end. For the first time since the Catalan GP in 2015, Marquez will start off the front row of the grid. At the moment we’re managing quite well, we’re only five points behind Lorenzo, but it will be a difficult season. The tyres are the same for everyone, but you have to work on the chassis in order to get the tyres working well. Then you have to work with the engine to ensure the electronics function well, and this is perhaps a bit more complex for us because we have a new engine, with the crankshaft rotation reversed for the first time on the Honda. For me, [things will become more consistent] next year. Perhaps it’ll be after the summer, with Brno and other races. I think we’ll be better, or at least will always be on the same or similar tyres each race. For now it’s normal Michelin continue to work and test them out, because there wasn’t a lot of off-season testing, even for them. It’ll be nice for the show, and to see what riders can do when they’re on new motorcycles. It’ll also help to better understand the potential of the bikes and riders. As for Honda, it’s a great team and the best solution was continuity. Marquez says he can win in Italy, if the Repsol Honda team can improve the acceleration of the RC213V. I look forward to the next two races: we need to focus and concentrate on Mugello and Montmeló, which are two very different tracks from both Jerez and Le Mans. They require more corner speed and if two years ago I would have said that they were demanding tracks for us now I think that maybe they can be better. We have work to do but I believe that if we improve the acceleration, our bike is one of the best out there. Not easy to get it due to the actual rules that prevent us from working on the engine, but I know that Honda is working hard on every other area of the bike and I believe in them. So we remain positive and in Mugello we will go with the podium as a target. Marquez says that his RC213V Honda has slipped behind Suzuki as the worst accelerating MotoGP bike, bearing Aprilia. The problem is, under acceleration, we are losing a lot. If we improve the acceleration, we will have one of the best bikes. It’s hard – on the straights the time is free, and it’s difficult for your mentality when you can’t follow people on the straight. We will have this for the next two races minimum. We know where we need to improve, but on the other hand it’s difficult in the middle of the season because the engines are closed [sealed]. If we made a ranking of acceleration, it would be: Ducati, Yamaha, Suzuki, Honda. 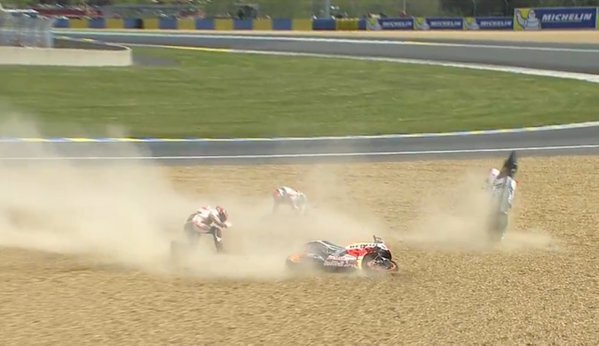 Marquez crashes in the Le Mans GP, at the same time as Dovizioso crashes on the same corner. He continues the race to finish 13th (taking three points). It was a pity about the crash today. I was having a good race, but these things can happen when you’re at the limit on every lap. I could have opted for a more conservative race, but here you can end up far back if you do that, so today I had to take risks. In the race I saw that I was losing ground under acceleration, and I had to make that back with my braking. Finally I lost the front and crashed. The positive is that I managed to get three points and I’m only five off Jorge Lorenzo in the standings, which isn’t a lot. Now we have a run of tracks that we found a little tough last year, but they’re quite different to Jerez and Le Mans, so I hope to be fast and have some good races. Marquez places second on the grid at Le Mans. After starting slowly in Q2, he sets his fastest time, 1’32.416, on his penultimate lap, which secured his front row position, and his 16th consecutive front row start. He is 0.441s behind Jorge Lorenzo, who takes pole. I was able to set a good lap today, but it wasn’t perfect. At first with the new tyre I found it hard to get the same feeling I had with used tyres and the bike moved about a lot when I tried to push more. At the end I changed my riding style a little and set two pretty good laps that helped me to fulfil my main objective, which was to get on the front row. I think the pace that I have isn’t bad, and in the last free practice I felt comfortable, although I’m still not quite as fast as Jorge [Lorenzo]. We’ll see what weather we have tomorrow and what the track temperature is for the race, and try to manage things as best we can. When asked about the lack of late-race overtaking this year, Marquez says winglets could be a factor, along with the new Michelin tyres. It’s difficult to say, it’s many things. We are trying to understand the tyres, it’s difficult to manage all the [race] pace because you don’t know when they will drop [laptime]. And, another thing, the wings didn’t help for the show, for the overtakes. This also can be a good reason, now it’s starting to be kind of Formula 1. When you take the slipstream you don’t have the downforce, then you have more wheelie, so it’s more difficult to overtake. Marquez comes third in the Spanish GP at Jerez. Valentino Rossi wins the race, some three seconds ahead of Jorge Lorenzo. Honestly, today Valentino [Rossi] was on another level, like I was in Austin, and the most important thing is that today we accepted finishing third in the race. I learned a lot from last year and and I didn’t want to make a mistake. I was very focused from the start and I tried to ride strongly and stay with Jorge [Lorenzo], but I could tell that with the higher track temperatures – 11º C higher than yesterday – it was very difficult for me to manage the front tyre well. I almost crashed several times, so in the end I made a difficult decision in front of our fans, as we preferred to secure 16 points that will be very positive at the end of the season, which is very long. We must have patience until we take a step further with the bike’s acceleration and find something else that allows us to fight for the win. Marquez places first in Warm Up, 0.204s ahead of Valentino Rossi. Marquez takes third place on the grid at Jerez, behind Jorge Lorenzo, and Valentino Rossi, who takes pole. I’m satisfied because before the qualifying session, we knew it would be difficult to get pole position, and the goal was to achieve a place on the front row. I think we did a great job; I rode well and I felt comfortable on the bike. Thanks to the work of the whole team, we tested three different setups that ultimately allowed me to be consistent in qualifying, which isn’t usually something I’m able to do. All I can say is that today Jorge [Lorenzo] and Valentino [Rossi] were faster than me. We’ll see if we can stay with them during the race tomorrow, because it seems that they have a very good pace. Marquez is fifth in the first free practice session for the Spanish GP, 0.568 seconds behind leader, Jorge Lorenzo. The session is marred when Marquez’s bike cuts out during a practice start and forces him to return to the pits on the scooter. In the second session, Marquez, with winglets fitted, completes the circuit in 1’39.900 to set the first sub 1’40 lap. However, he ends the day 0.345s, in second place, behind leader Lorenzo. Marquez drops almost a full second off his time between sessions. Marquez says the European circuits will pose new challenges. I’m happy with these races but in another side I want to arrive in Europe. Different kinds of racetracks, more narrow, different kind of tarmac, it’s the older style tarmac. Honda is working hard and I keep pushing a hundred per cent, every practice, every lap and it looks like [in Austin] we could manage, but the question mark will be Europe…We understand more things, and still Honda is working hard to bring us some acceleration. Especially in fourth, fifth, sixth gear, I can’t follow Suzuki, Yamaha or Ducati… so they are doing a big effort and they are starting to bring already some new parts. Marquez says MotoGP’s switch to Michelin tyres prompted him to try to adopt a smoother riding style during pre-season testing. During the pre-season I was thinking a lot about riding style, trying to find another way to ride with Michelin and all of these things. Also the balance of the bike didn’t feel great, so I tried to change many, many things. But in the end, when I felt well on the bike – the first time in the last day of pre-season [testing in Qatar] – I tried to use again my normal riding style. Some slides, I tried to control these slides, because if not I will overheat the tyres. In the end, when a rider feels comfortable with the bike and everything is working well, it comes naturally. Your style is one [style] and you cannot change. I always have an aggressive style, sliding a lot, but in the end, OK, you can improve in terms of the condition of the track, but it comes natural…We must understand that this year it’s different tyres and the riding style is different. Of course I arrived [in Austin] and on the first day I was braking on the same point like on Bridgestone and I was not able to stop the bike. We must understand that this tyre works in a different way and have some worse points and some points that are much better. Marquez credits Honda’s improvements to his bike. Every time, we find something, something new, in the electronics or in the bike. We are improving step by step. [At Austin] we improved the start, the electronics on the start, so the start was much better than the other ones. Also we improved a little bit the engine braking, we found something after Argentina, so step by step we are improving. On Friday I tried some wings, I tried a different fairing, so we are working. OK it’s possible to be [going the] wrong way, but I hope that now we are in the correct way and we must follow this way and try to work with the same style…I remember the feeling of Malaysia that I was pushing 100 per cent in the first day [of pre-season testing] and I was 1.5 seconds slower per lap than Jorge [Lorenzo]. That feeling was really frustrating. But the key I think is I always believed in Honda, in my team. They worked a lot. They are still working because we are not at our 100 per cent level with the performance. Marquez says Michelin helped in his choice to chose a soft front, going against the rest of his rivals, saying he pushed as hard as he could early in the race because he was unsure how long the rubber might last. During warm-up I tried a different front tyre [the medium], the same as everybody was using, but I didn’t feel good,” Marquez said after the race. I want to thank the Michelin guys because they helped me to make the decision [to use the soft]. Until lap 12 the tyre was perfect but after the race it was completely destroyed. I knew it would be on the limit, but I try to use this potential in beginning of the race, try to open this gap. I kept pushing during all the laps because I didn’t know when the drop would arrive. When there were five laps to go, I start to feel a big close feeling at the front. Of course I’m happy with this advantage that we have. Okay, it’s only the third race, but we already have 21 points so this is really important for me and the team. The other riders make a few mistakes, but you must be there – and now in Europe we will see, because Jorge will be really strong. Marquez wins the Americas GP, at the Circuit of The Americas course in Austin, Texas. It is his fourth win in a row. Marquez leads from the front throughout the race. Jorge Lorenzo is second. Valentino Rossi, Dani Pedrosa and Andrea Dovizioso all crash out of the race. I’m really happy. I feel really great on this circuit. Marquez claims his 60th pole of his career and takes the pole position in the Americas GP for the fourth year in a row. 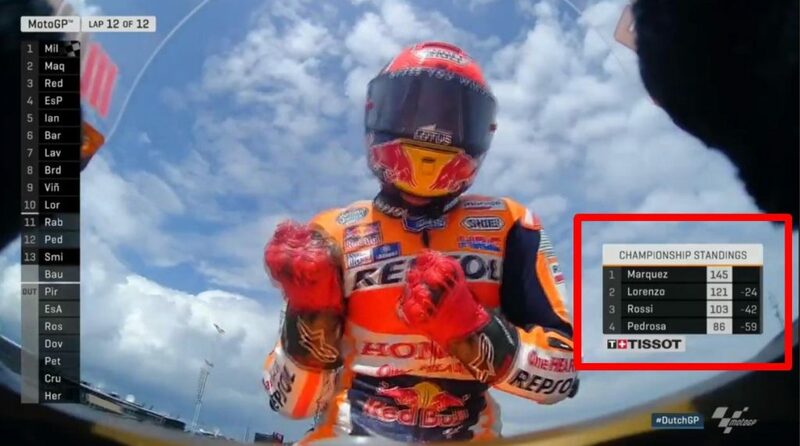 His time of 2’03.188, is 0.069s faster than Jorge Lorenzo. Valentino Rossi places third. Rossi says he no longer buys his rival’s claims of weakness. I always considered he was very dangerous. The Honda seems very good to me. According to me, when he talks about difficulties [with the bike], Marquez plays a bit of tactics, he feathers his own nest, but he knows very well that this is a very strong bike…It’s true also that he looks much faster than [Dani] Pedrosa, especially here [in Austin]. This means he’s comfortable and he will be hard to beat. Marquez says he is looking forward to the Austin GP. He won his first MotoGP race there in 2013, at age 20 the youngest ever rider to win a MotoGP, and has since won three straight victories all from pole position. It’s a track that I like, where I feel strong, and where I’ve always had good races and good fun. The track rewards strong acceleration, which hasn’t been one of our strongest points so far this year, so we’ll have to wait and see how we can manage the situation. We’ll keep working hard, as we did in Argentina, and we’ll try to find the best pace for the Sunday race. MM: Austin is actually one of them, but I also love Phillip Island and Aragon. I like the left turns, because I grew up riding flat track, and they all have many different types of sections and corners. Lots of elevation changes. LS: Are you a fan of the many rider aids like wheelie control, traction control etc? Or would you rather it be all down to the rider? MM: The bikes we ride are developed for them. So you have to use them, if you were to take them out you’d have to redesign the bikes. But the aides are for safety. If you tried to use them to make you fast, you would not. LS: Would you like to run the Isle of Man TT one day? MM: Yes, but only for fun, not for race. Marquez wins the Argentinian GP. Marquez came under pressure from Rossi in the first half of the 20-lap race, but after the pit stop Rossi fell seven seconds behind Marquez. Rossi was then overtaken by Andrea Dovizioso and Andrea Iannone of Ducati. However, on the final lap, the Ducati riders crashed, leaving Rossi in second.